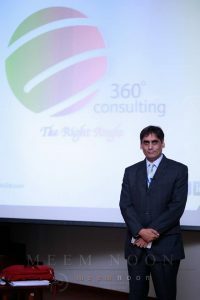 Wasif spent the majority of his career with FMCG/Food & Beverage sector. He has worked in Senior Leadership positions in Sales, Marketing and Human Resources. His last assignment was with Coca-Cola Beverages as Director Human Resources. Wasif is very passionate and energetic individual with in-depth knowledge of Sales & Distribution Systems especially for HORECA and Export Markets. He has negotiated several JVs for his previous employers and has lead successful operations in UAE, China, Afghanistan and Pakistan. He is also very adept to run start ups in various countries. He contributes as speaker on HR topics at National and International level. He has attended ‘Train the Trainer’ from Ken Blanchard Europe, ODI USA and Nelson Buchannan & Oostergard Singapore. He is visiting faculty for Punjab University, NUST-PIQC, Pak AIMS and Superior College. He is also Member Board of Governors for Institute of Business Management at UET, SAARC Association for Management Development, American Compensation Association, Executive Body of ‘United Spirit’ a body for Youth Empowerment and Head of Board of Trustees for Lahore HR Forum. His pupils are serving in the leading organizations in Pakistan and abroad. Wasif brings a unique blend of hands on practical experience along with exposure to world class best practices .